The Kempinski Grand Hotel des Bains St. Moritz has three excellent restaurants, all awarded Gault Millau points in 2008. In the Les Saisons restaurant (14 Gault Millau), executive chef Matthias Schmidberger relies on the best ingredients in the area and creates magnificent, delectable dishes. This casual dining restaurant serves a buffet breakfast and à la carte dinner. 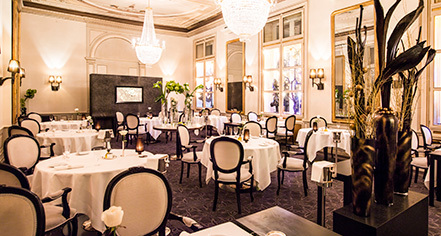 The Michelin Star-accredited gourmet restaurant, Cà d’Oro (15 Gault Millau) has dedicated itself to Italian haute cuisine, along with seafood interpretations. Diners can choose from over 550 wines from all over the world to accompany their meal. This formal fine dining restaurant is only open during the winter season, serving dinner. In the authentic, restored, historic medallion hall, guests can enjoy "Alps Tapas" in the Enoteca Bar (14 Gault Millau). 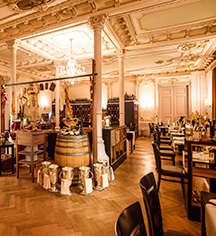 In addition to innovative Swiss dishes, freshly cut sausage and box specialties are served in a delightful ambience. The centerpiece of the newly designed bar is the fireplace, which invites guests to an aperitif or digestif in a cozy atmosphere. This casual restaurant serves an à la carte dinner.